The 2001 NHL Entry Draft is not one that hockey historians will hold in high regard, there were a few players who’ve had some good careers, but four of the top ten played less than 200 league games, before disappearing into the fog of history. Only 17 of the 289 selections are still in the NHL today. The draft was held at the National Car Rental Center in Florida. The Atlanta Thrashers had the first overall pick after being bumped up three places by the lottery. The second pick would have gone to the New York Islanders, had the pick not already been traded away. The Ottawa Senators gained the pick, alongside Zdeno Chara and Bill Muckalt at the expense of Alexi Yashin. While the Thrashers opted for Ilya Kovalchuk with the first pick, the Senators drafted the highest ranked North American; Jason Spezza. 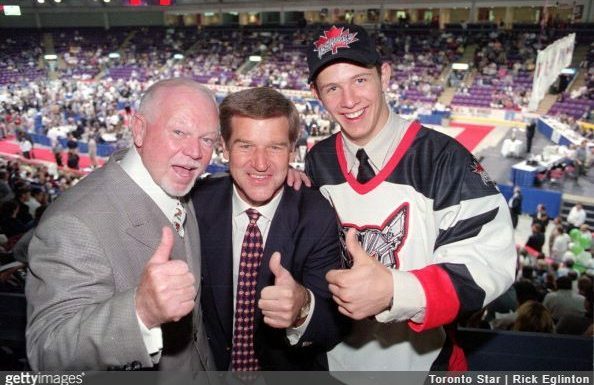 On October 24th, 2002, Spezza played his first game for the team and scored his first NHL point, assisting on Marian Hossa‘s powerplay goal in a 2-2 draw. That debut season saw Spezza play 33 games, score seven goals and fourteen assists. With the 2004/05 season abandoned due to the lockout, Spezza returned to the AHL’s Binghampton Senators where he dominated the league, scoring 117 points in 80 games. With labour issues resolved, Ottawa moved a number of players out and Spezza was sent to the top line, alongside Daniel Alfredsson and 2000’s number two draft pick Dany Heatley. The three became one of the better offensive lines in the league and the 2005, 2006 and 2007 seasons were Spezza’s best from a point production side. Where is Jason Spezza now? Still playing NHL hockey but not in Ottawa. He was traded to the Dallas Stars in 2014 and has rediscovered some of his previous good form but hasn’t quite found the consistency of a decade ago. Not that that’s unusual. The Stars have played reasonably well with Spezza controlling the puck and he’ll likely have another few seasons in Texas. Did the Thrashers miss a trick by drafting Kovalchuk over Spezza? Yeah, but only just. It’s more like Spezza had a lucky escape. Ottawa is by no means the hockey capital of the world, or even just Canada but they didn’t have the problems that the Thrashers had.